Film screening organized by Wellspring. 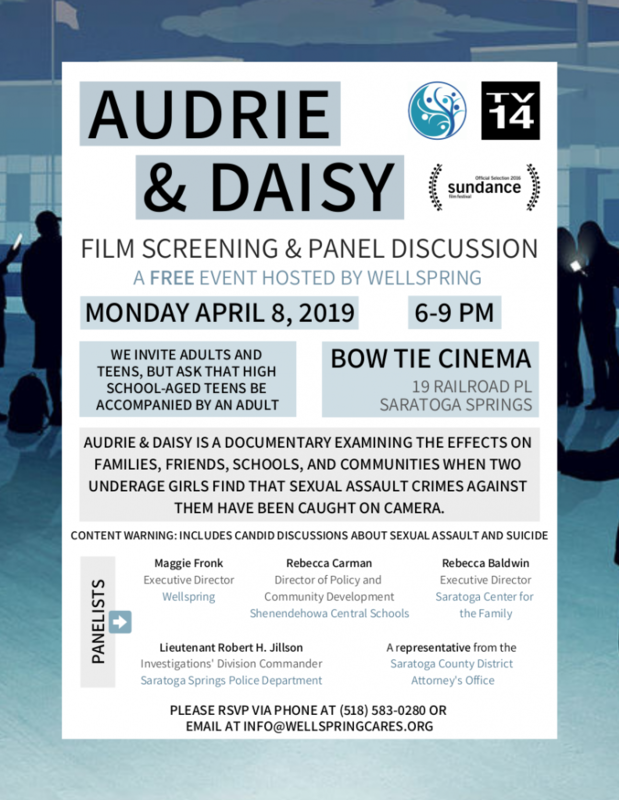 Audrie & Daisy is a documentary examining the effects on families, friends, schools, and communities when two underage girls find that sexual assault crimes against them have been caught on camera. This free event is hosted by Wellspring and includes panelists Maggie Fronk of Wellspring, Rebecca Carman of Shenendehowa Schools, Rebecca Baldwin of Saratoga Center for the Family, Lt. Robert H. Jillson of Saratoga Springs Police Department, and a representative of Saratoga County District Attorney's Office. This film is TV-14, meaning there will be mature content throughout the film because it includes candid discussion about sexual assault and suicide. Therefore, we suggest that adults attend but we also welcome adults who bring their teens with them knowing that the content of the film can activate many emotional responses. RSVP required: RSVP by phone 518-583-0280 or email info@wellspringcares.org.